Statham, Crews, Lundgren and Van Damme on looking the part and working with the master of action movies. The guns come huge - both bicep and semi-automatic-wise – on the set of “The Expendables 2,” but how big was the competition between action heroes young and old for the most massive muscles? Jason Statham: You never see any signs of pain. If someone has got a twisted whatever, no one is going to show that sign: ‘No – I’m fine.’ A lot of the stuff that we do, the ego gets thrown out of the window. Everyone has made their stamp in some way, so there is nothing to prove. We just want to get stuck in together, so there is a good feeling about it. No one is trying to fight for the camera here. The better everyone else looks, the better we all look. Sylvester Stallone, Jason Statham, Jet Li, Dolph Lundgren, Chuck Norris, Terry Crews, Randy Couture, Liam Hemsworth, Jean-Claude Van Damme, Bruce Willis, Arnold Schwarzenegger and Yu Nan blow stuff up and try to put a lid on six-pounds of weapons-grade plutonium. Opens Aug. 17. Scott Adkins: The gym was pretty full every night with famous faces. Everybody secretly trying to keep up with each other…You’re expected to look a certain way. It’s the action film of the summer: you got to look like an action star. I think everybody is respectful of everyone else doing it. Dolph Lundgren: It’s too late once you start shooting. If you’re not in shape by the time you get there, you’re never going to do it. It’s too hard and the schedule’s too tough. You had better get in shape if you’re going to last through the picture. So I don’t think there’s any kind of positioning – you just try to do your job and you try to deliver what’s expected of you rather….You have to be able to kick run and do whatever you have to do. The rest is just hard work and waiting around. Jean-Claude Van Damme: Flexibility, fighting wise, I know how to kick today as good as 'Blood Sport,' but mass-wise I lost weight again for another movie. 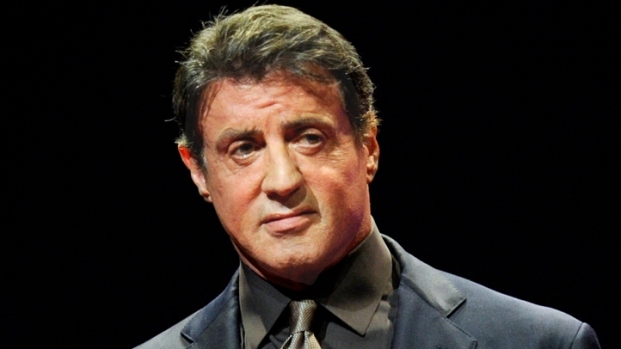 Sly said, 'Your arms, your guns – they are too small! They look like toothpicks.' I said, ‘Don’t worry – I can go to the gym.' I went to the gym every day and did light, light, light weights, because if you don't take the juice you can not get big. So, light weights you can get big naturally. You have to eat and you have to do lots of long reps for a long, long time. You're doing arms every day. So I was concentrating on the arms only and he put me with that black T-shirt so you don't see the chest. You look like a crab, you know. Sylvester Stallone Talks Stunts in "The Expendables 2"
Sylvester Stallone chats with Access' Billy Bush at CinemaCon 2012 about "The Expendables 2." They discuss whether Stallone did his own stunts or left it up to the pros. 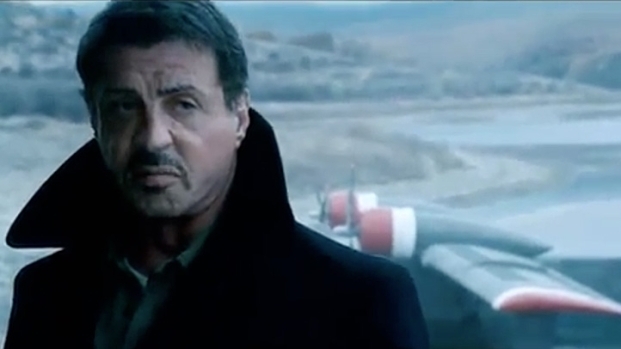 Plus, Stallone reveals that he still enjoys being famous after all these years. Statham: They know what they’re doing. It’s a bit of a wink to certain sort of films they’ve all done – Arnold comes in and says ‘I’m back!’ There are all these sort of homage moments that come, and I don’t think anyone is scratching their head to try and create a character. Their character has already been established. Adkins: The one day [on set] with the three of them together, it was such camaraderie from the Planet Hollywood days. Bruce Willis and Arnold Schwarzenegger ganged up on Stallone, taking the Mickey out of his shoes, which I thought was quite funny. They’re on the level playing field and are friends that go back a long way. It was just fun to see that. Crews: It was a dream come true to be able to walk up to Arnold Schwarzenegger and tell him he's terminated. It's one of those things that you go oh man, I could do this – This is America! America's a great place! Statham: He’s the conductor. He likes to be that. No disrespect to Simon West because he’s the director of this film, but Sly creates these characters and he writes them so he knows them inside out. If you’re not hitting the right note, he’s the first person to tell you! Adkins: Obviously he knows a lot about it because he’s the first guy to manufacture three franchises that have been successful. He’s been at the top of his game for over 30 years, and you can’t say that of many people. Obviously, everybody respects and knows what he’s done – how he talks and everybody listens. That’s why he’s able to be the ringmaster of all these big personalities, these big action guys. Everybody respects him and if you’re smart, you’ve gotta listen to what he’s said and pay attention. Crews: He's like a magician. The brilliance of Sly is that he didn't give us a lot of backstory so you can keep building. Nothing's been set in stone…so it works out that there's a whole 'nother story somewhere deep in there for a 3 and for a 4 where you just keep going. This is the magic of Sly, this is why there are five Rambos, six Rockys. He really understands the lure of keeping everybody like ‘More, more, more!’ It's an amazing thing to watch. Statham: You’d think that would come out a lot, but I think I’m the only one who says it! I’ve actually said it more times than you might imagine.